Wire - any wire would do ...you don't need jewelry quality wire and the thin cheap ones are even better as they are easy to twist and turn! 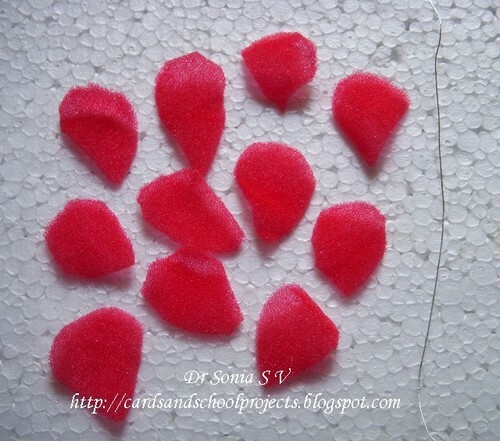 Cut freehand rose petals...you dont have to stress out on the shape...a rough tear drop would do. 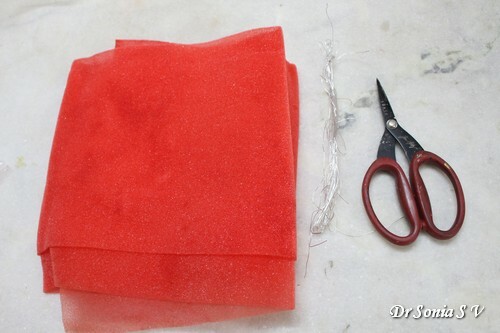 Sponge is super easy to cut and in fact you can layer several layers atop each other and cut too ! To make the central bud of the rose take a petal and roll starting from the tapered end as shown in the photos above and below. 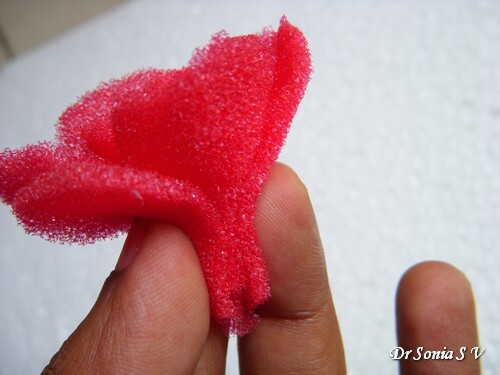 Hold the rolled petal in your hand and tweak the shape to whatever you feel looks good! 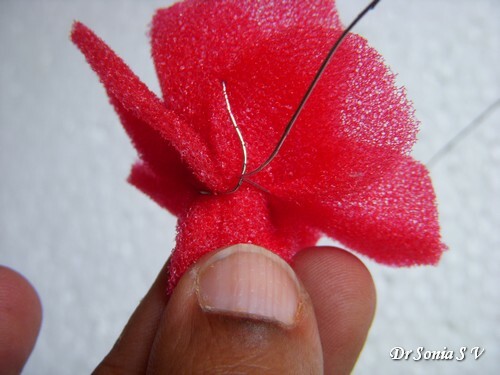 Add petals around this central bud. I added 2 petals to surround the central bud and then added 3 around that. 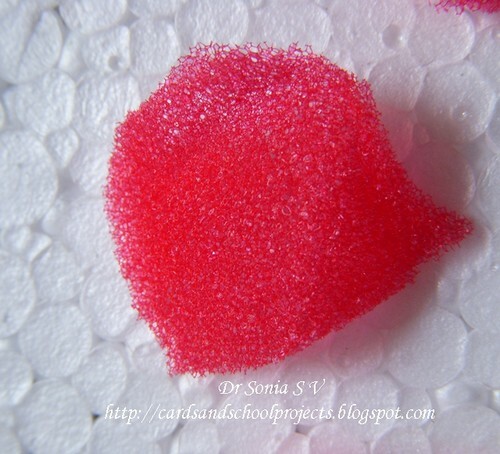 The number of petals you add in each whorl would depend on the size of your petals adorable how full you want your rose to look. 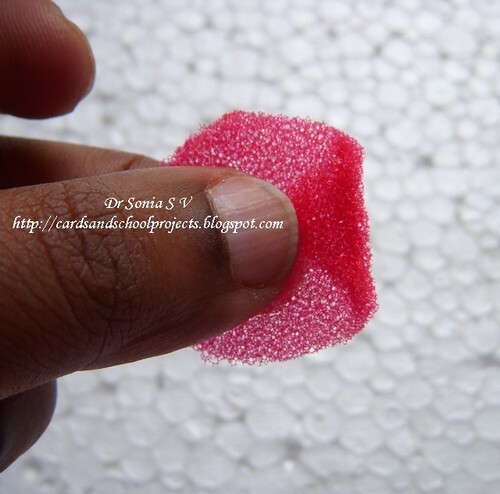 While you add the petals it is easy to adjust their placing and height since you are just holding the sponge between your fingers and not hot gluing or using any kind of adhesive! I finished off the rose by adding 5 petals in the outermost layer. Since your petals have a tapering edge you will actually be holding the rose by the tapering part of all the petals as shown above. 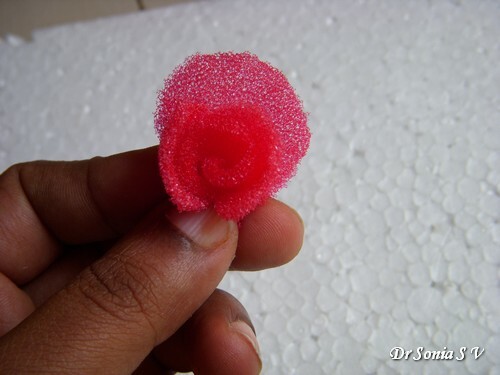 To make your rose take a thin wire and simply twist it around this pedicle! 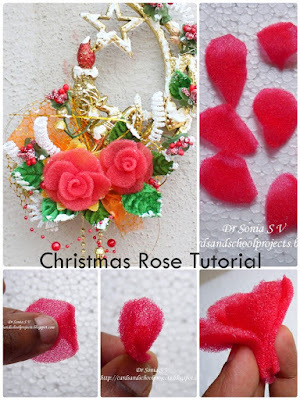 Complete a loop or two with your wire and your rose is done! 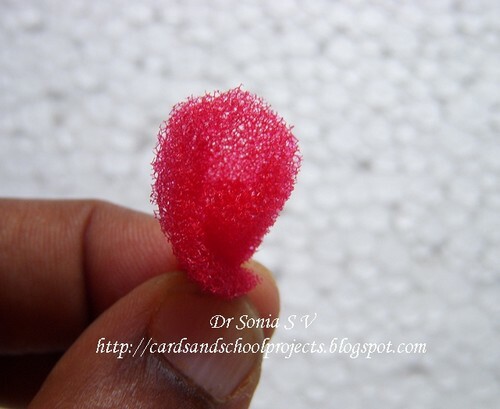 You dont have to tightly twist the wire as sponge will expand and give a nice tight fit and in fact if you are too tight with the wire twisting you can cut the delicate sponge! 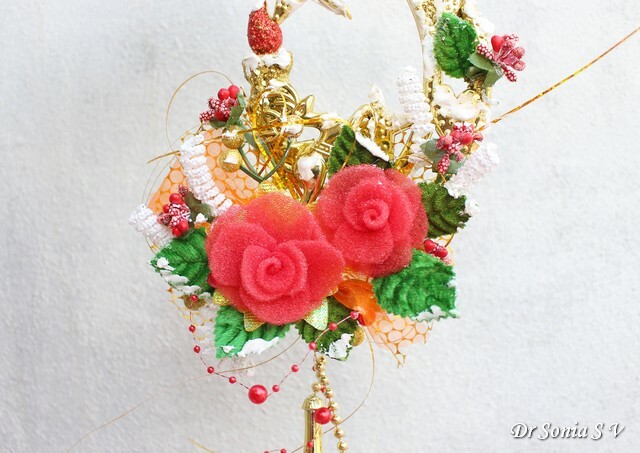 The photo below shows the store bought decoration I altered by adding my sponge roses and giving a snowy feel with " whipped spackle"! The original decor item was too golden ....if you know what I mean!! I hope you like the altered version! 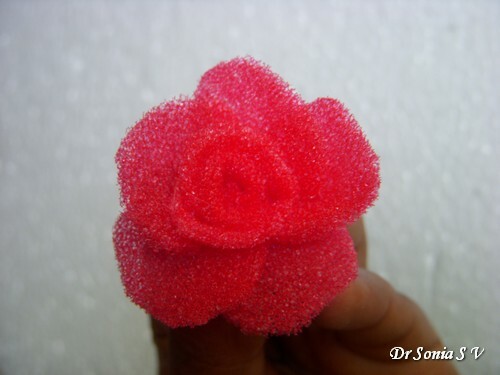 I hope you liked my Sponge roses...do tell me how they are! 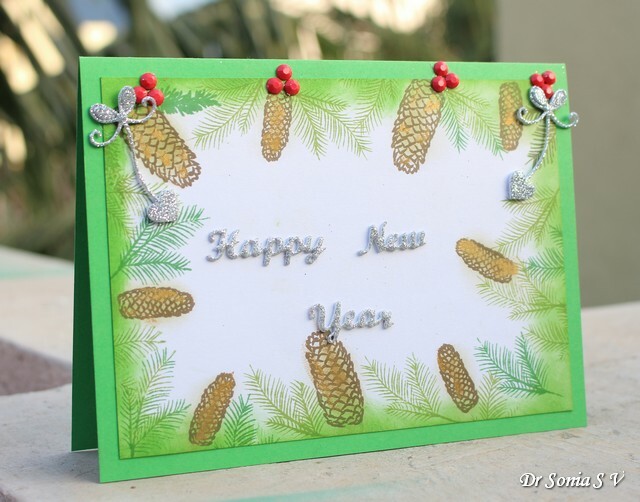 Made the pine cones shimmer by rubbing Inka Gold on the stamped pine cones! And of course I had to add a bit of sparkle with silver glitter foam heart ornaments! 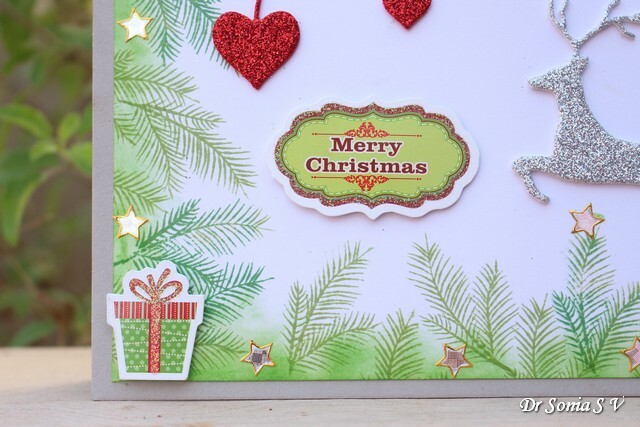 The red berries are rhinestone stickers. 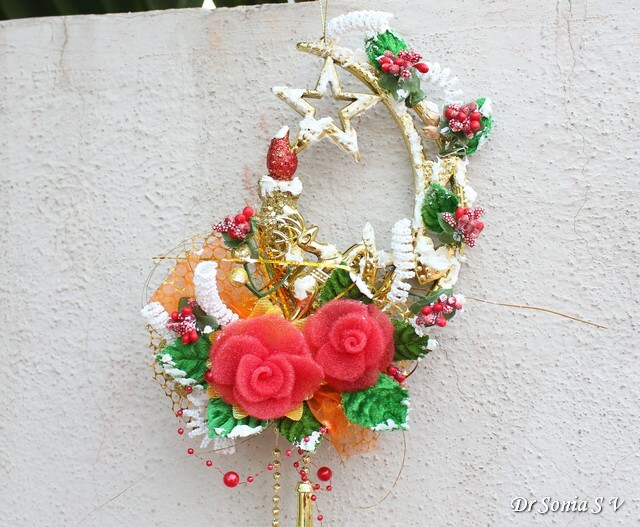 A Merry Christmas to all my crafty friends ! 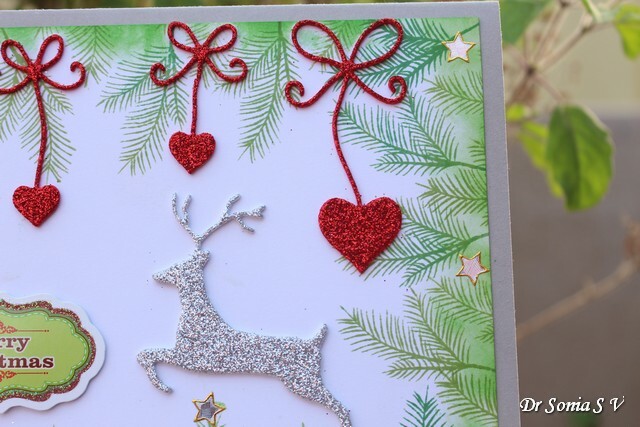 For a pop of red I added Memory Box heart ornaments cut in glitter foam and added a Memory Box silver deer leaping through the woodland! It's a simple card but was super fun to make! Hi friends it's Christmas Eve and I bet Santa is zooming all over the world spreading cheer and happiness ! 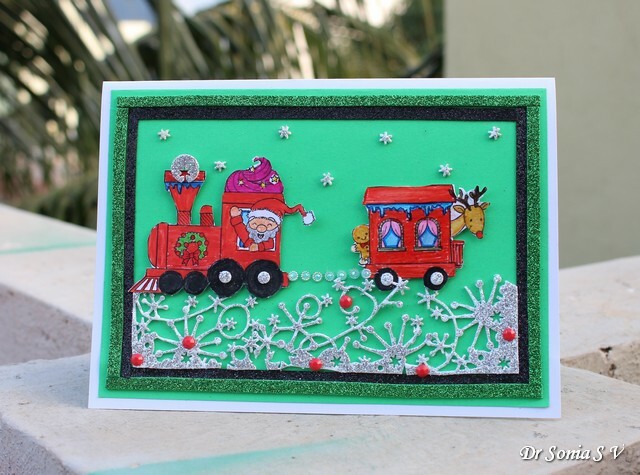 Sharing yet another card featuring the cute Santa Express stamp colored by my daughter and made into a simple card with a little help from me! 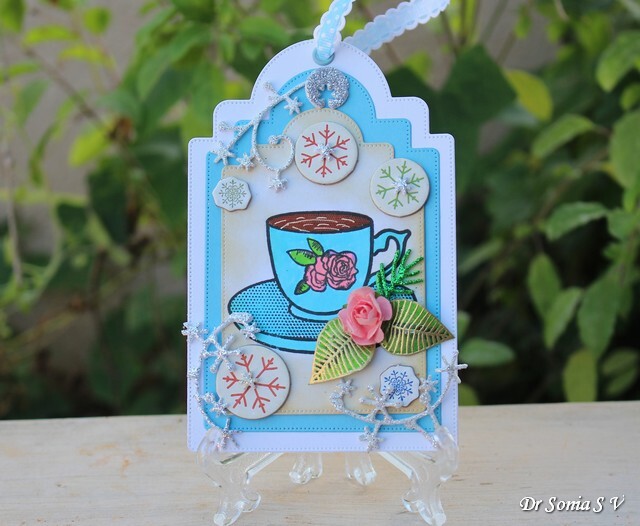 Hi friends sharing a simple tag I made using a gorgeous Winnie and Walter stamp set I had won during World Card Making Day Contest. 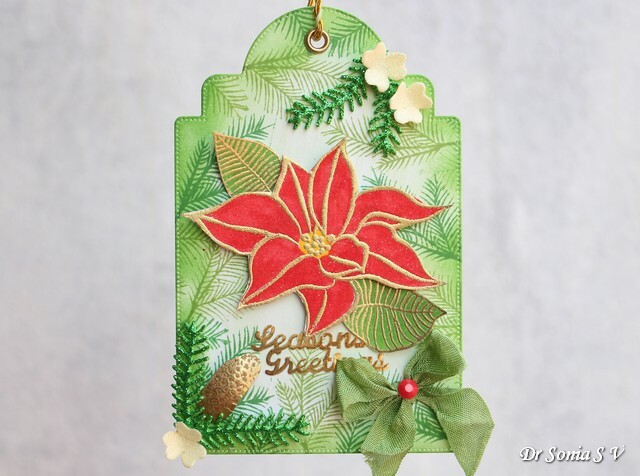 I die cut a tag and stamped tiny pine leaves from the Winnie and Walter In Bloom Elsa's Flora set in 2 shades of green using Memento ink pads. Distressed the edges using Artistry inkpads [you can read about Artistry ink pads here : Artistry Ink pads Review] . 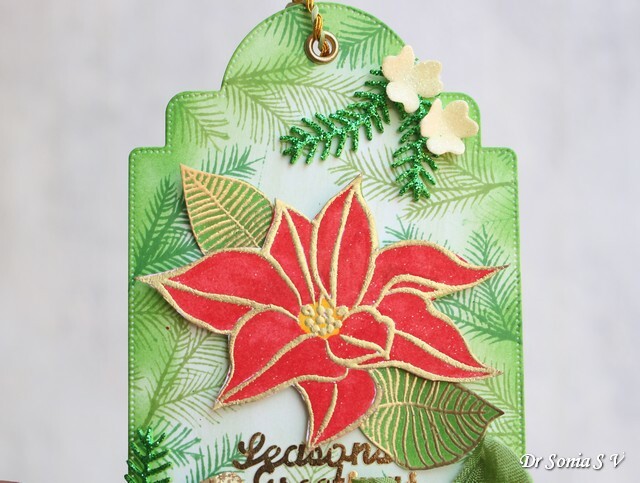 The gorgeous Poinsettia and leaves are from the same set and I heat embossed them in gold and colored it with Akashiya Sai watercolor brush pens and later added them to the tag after fussy cutting . 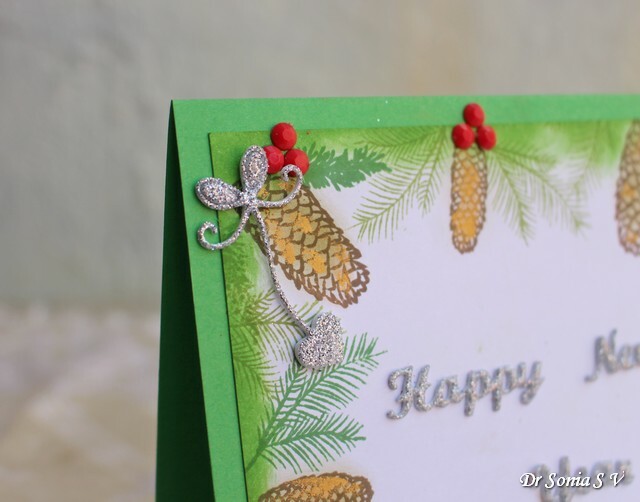 The tiny pinecone which is also from the same stamp set was heat embossed in gold and colored with Distress Inks .I added Poppy Stamps pine leaves cut in glitter foam to my Pine cone which I had fussy cut and shaped with an embossing tool to make it convex and more dimensional. Its such a simple looking tag but can you believe I must have worked on it for more than an hour and I thoroughly enjoyed myself! 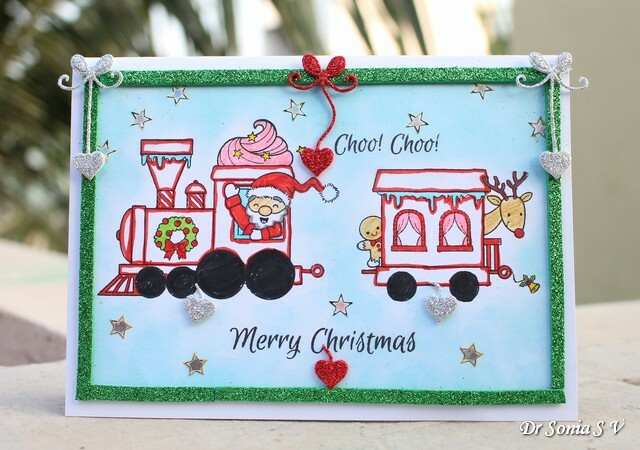 Hi friends Thank you so much for the warm appreciative comments on my daughter's Santa Express Card. 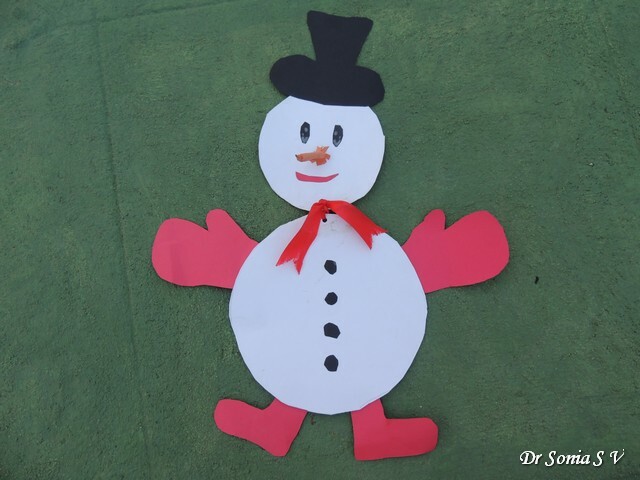 Here is another Christmas creation by my kiddo. My daughter is 9yrs but still very much a child at heart. 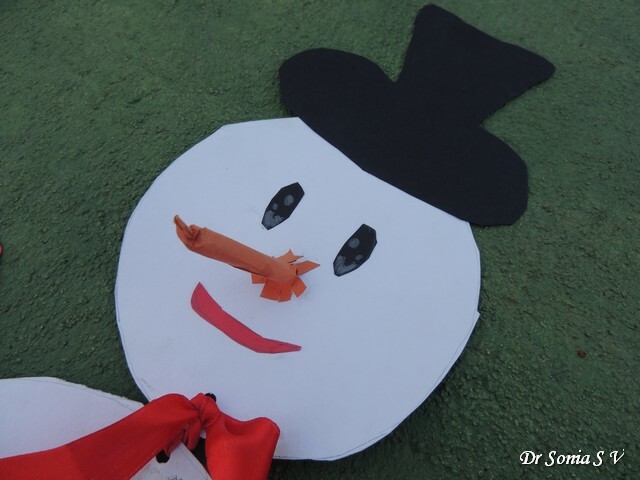 She was so excited when she made this snowman in her school and even boasted that she was one of the few children who got the snowman's nose right! Hehe his nose does look cute doesn't it! 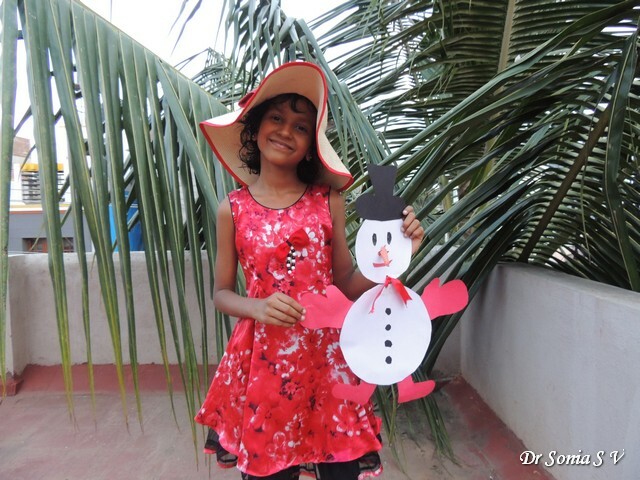 And that is my little crafter with her snowman! 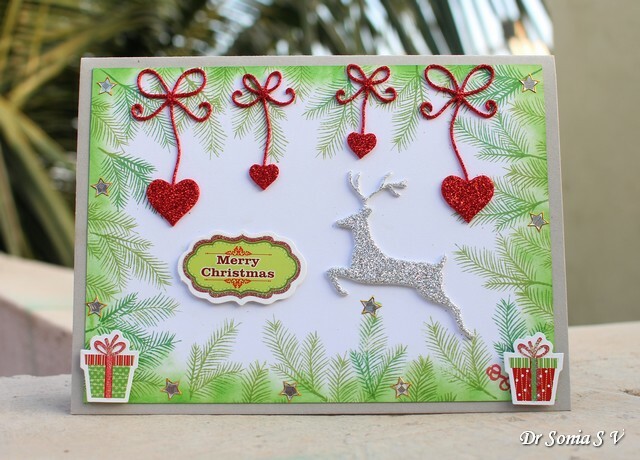 Hi friends sharing a super cute card made by my 9 yr old daughter ! She stamped, colored and fussy cut the Santa Express stamps from Your Next Stamp, an adorable stamp set I had picked up for her when I visited my friend Priya's craft shop. Dear friends I hope you will agree when I say there is something so charming about mobiles that they appeal to all ages! ! 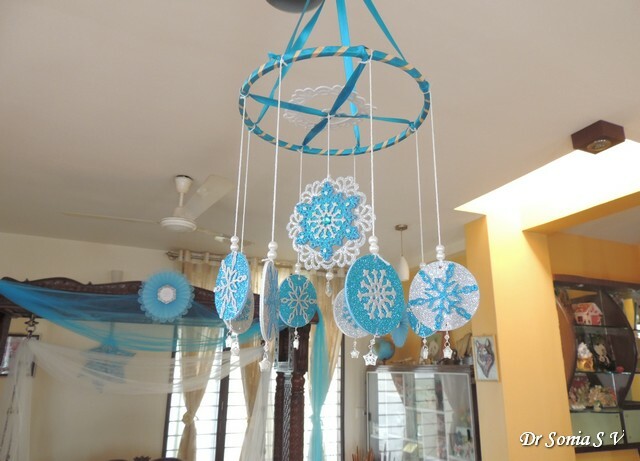 And who is not fascinated by the beauty of snowflakes! 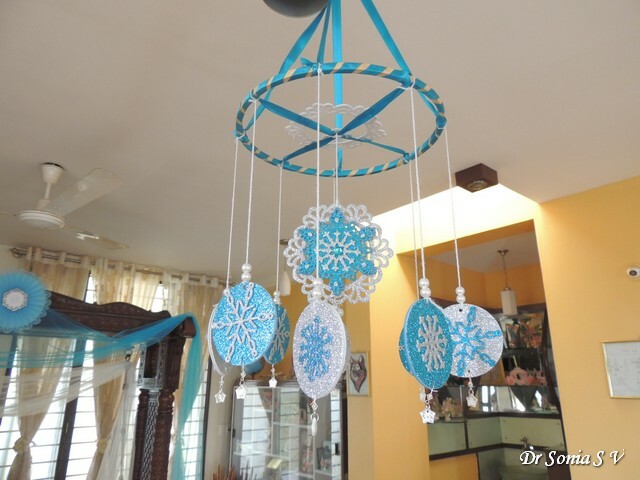 This DIY snowflake mobile was actually made for my daughter's Frozen themed Birthday Party but I am blogging about it this festive season since Glittery Snowflakes seem perfect for the season! And it's also my Guest DT project for Unstampabelles theme Sparkle and make someone smile......I hope my sparkly mobile can make you smile! 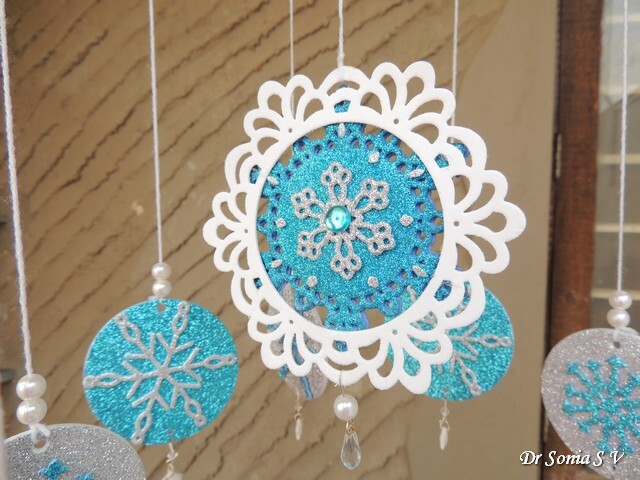 My DIY Mobile has glittery snowflakes die cut in blue and silver glitter foam and thick card stock[ ivory card] with beads and dangling crystals. 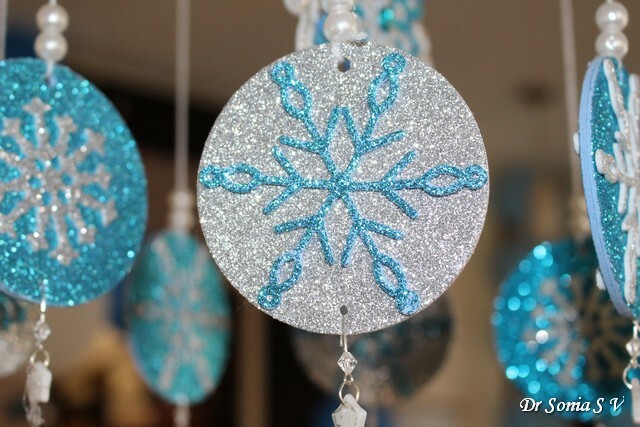 The delicate snowflake designs were stuck on glitter foam- card stock circles and has alternating silver and blue patterns.I threaded tiny crystals and acrylic snowflake patterned stars on to metal jewelry pins and rings and dangled them on holes punched on each snowflake! 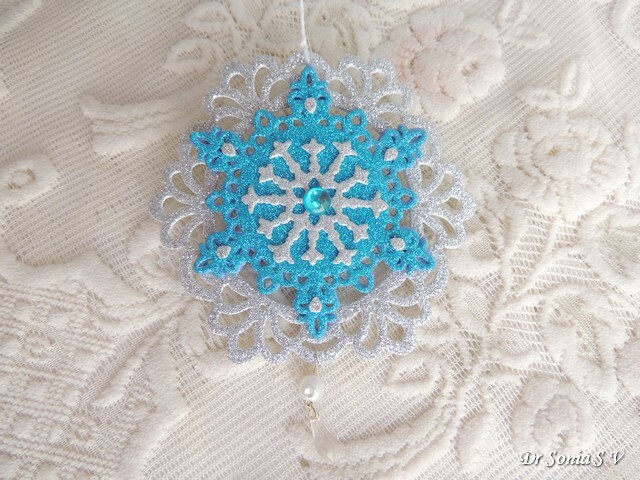 Shown above is the large snowflake in the center of the mobile- I used 3 different dies to make it and added a big blue rhinestone to its center. You can use any kind of sturdy ring you have at home but I guess the easiest and most easily available sturdy ring would be an embroidery hoop. 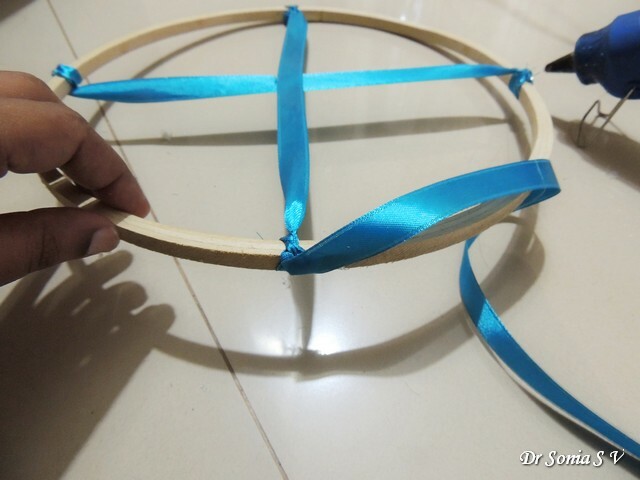 You just need to use the outer ring of your hoop. 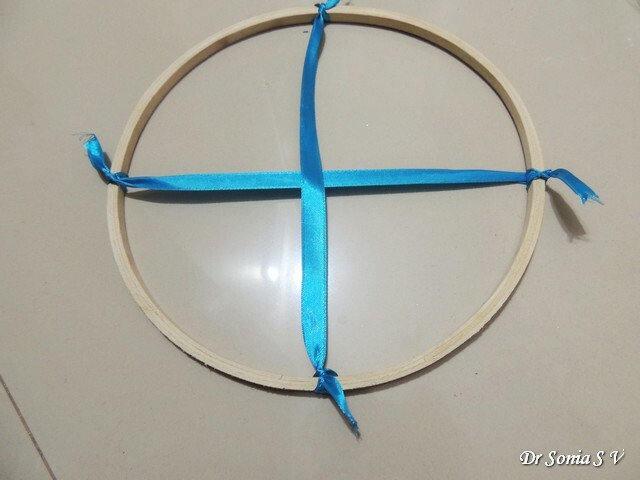 Tie a ribbon across the center of your embroidery hoop. Tie another one across it at right angles. If your ribbon knots are not very tight you can use a glue gun to prevent your ribbon knots from sliding across the embroidery hoop. Wind a ribbon or lace or whatever else you fancy around the hoop to jazz it up a bit.In our Dinosaur mobile I had camouflaged my ring with foam grass! 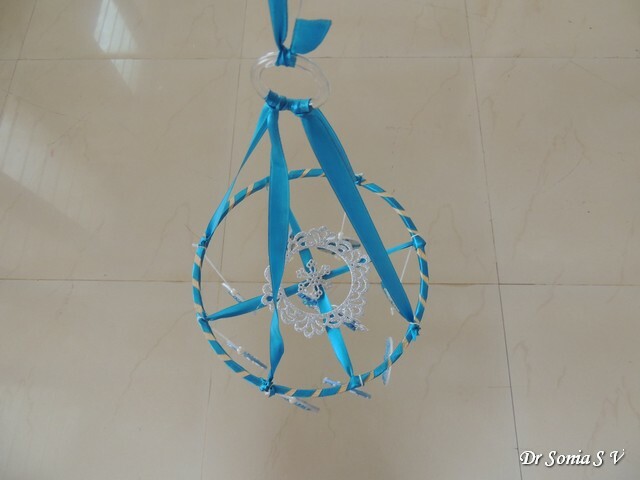 Its easiest to stay symmetrical if you tie ribbons in between the ribbons you had tied earlier---that way you can make a mobile which hangs beautifully and doesn't look too lopsided! 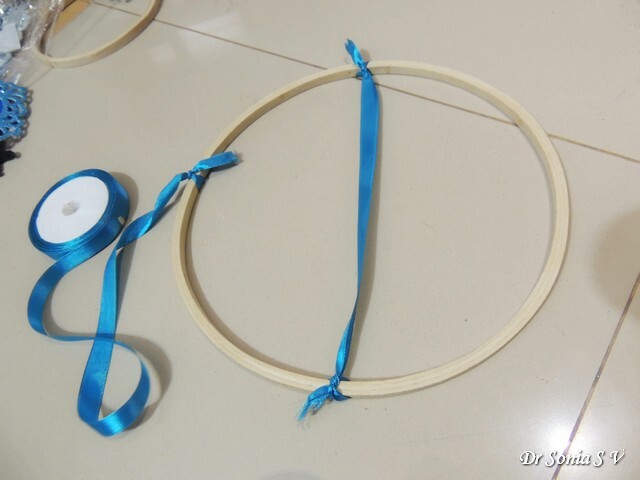 I tied the 4 ribbons to a ring [ you can use a bangle] adjusting the ribbon lengths so that my embroidery hoop stays horizontal and is not pulled up on one side ! That was super easy wasn't it ....! Well it is rather easy but tricky too! 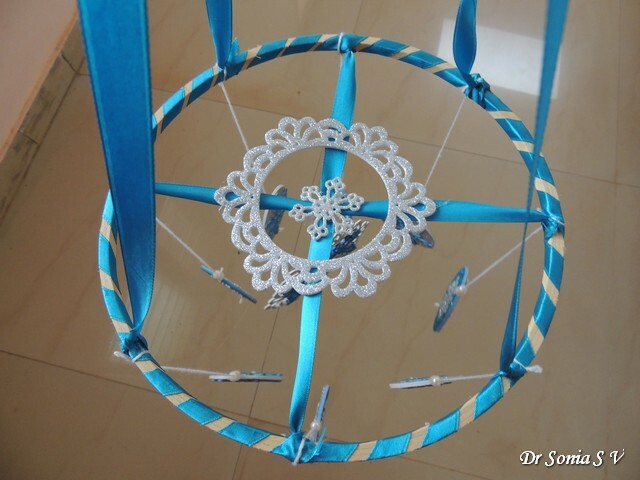 The tricky part will be adjusting the lengths of the ribbons and I would advise you to cajole someone into helping you in that step as judging ribbon lengths and keeping the hoop horizontal while you tie the ribbon can be tricky without a helper! 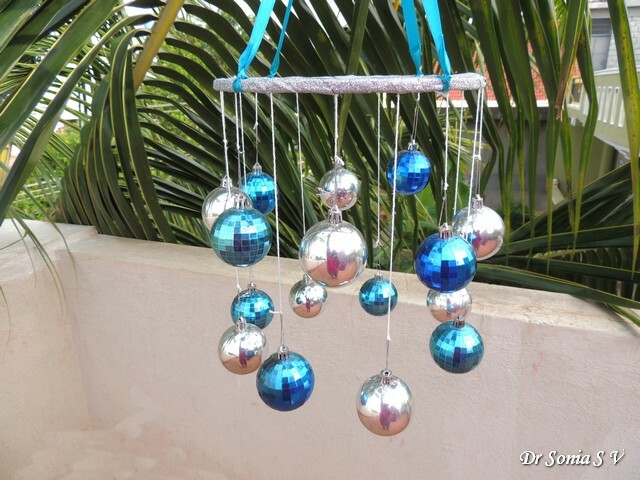 Here is another mobile we made using silver and blue Christmas tree ornaments! 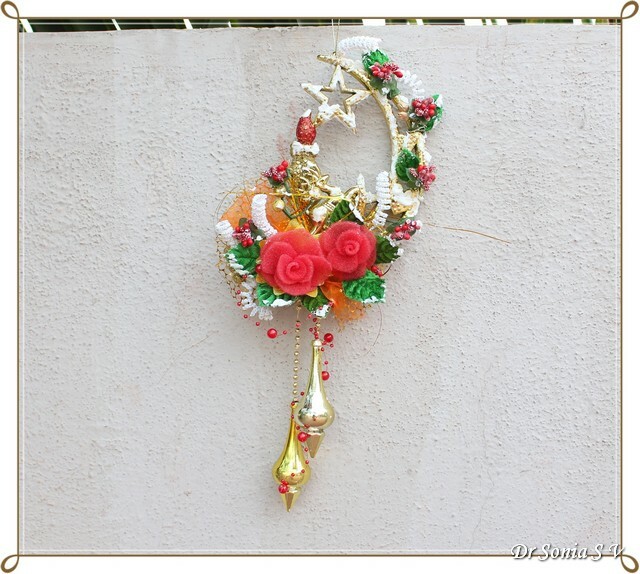 Here is a super short video lasting just seconds showing how the mobiles swing in the wind! 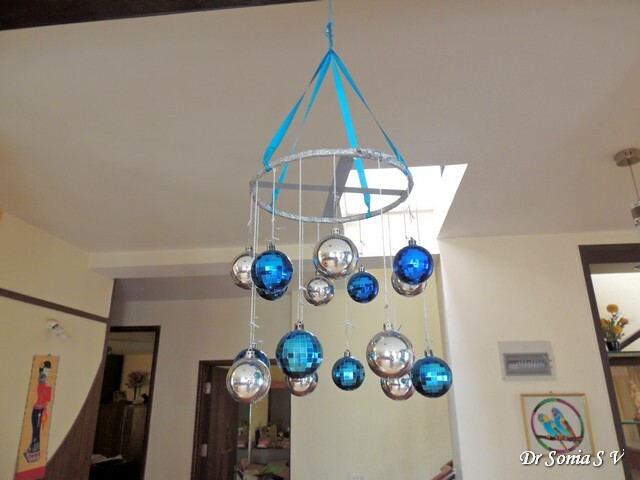 Both these mobiles were a big hit at my home and I hope you like them too! Hi friends I never knew decorating a tiny piece of paper would give so much joy! 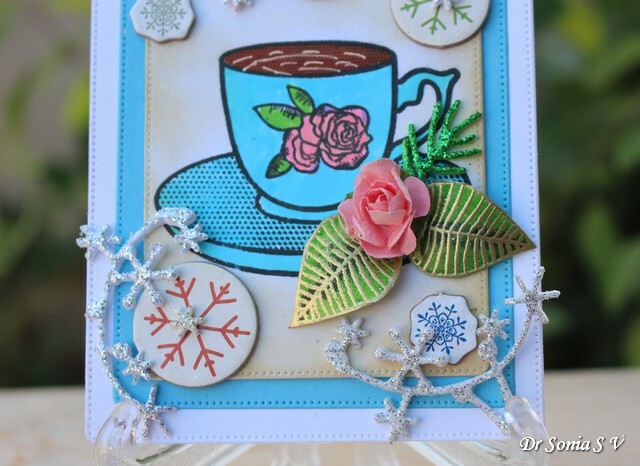 If you haven't tried making a tag...do give it a go...its fun , its quick and soooo satisfying! 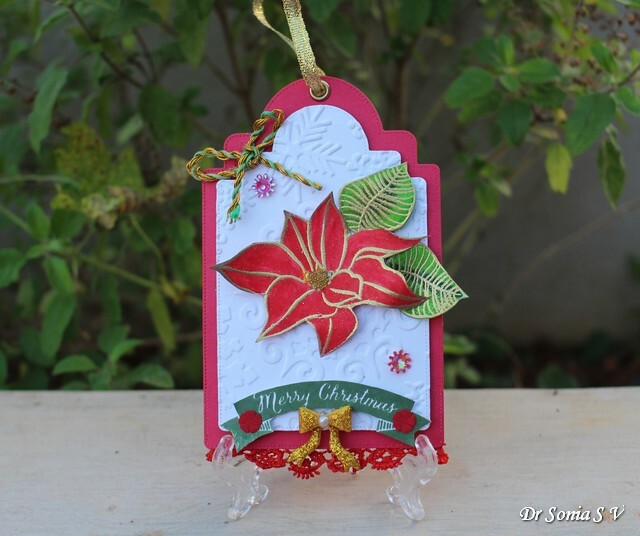 I stamped , heat embossed , colored and fussy cut the Winnie and Walter Poinsettia and its leaves and added them to a snowflake embossed tag. I got the vibrant colors by using the Akashiya Sai watercolor brush pen set my friend and craft shop owner Priya had gifted me when I had visited her a few days back. 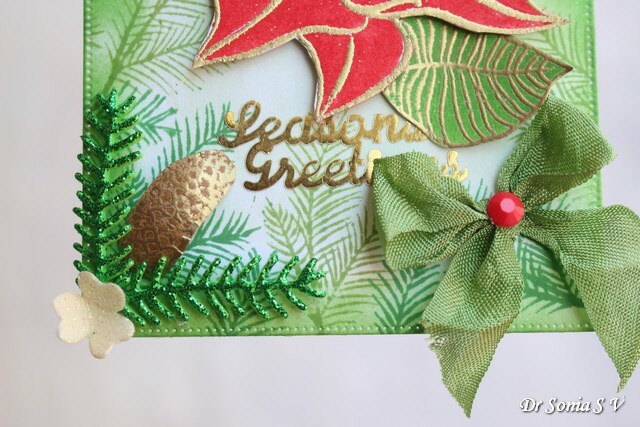 I added tiny golden glitter balls to the center of the poinsettia. 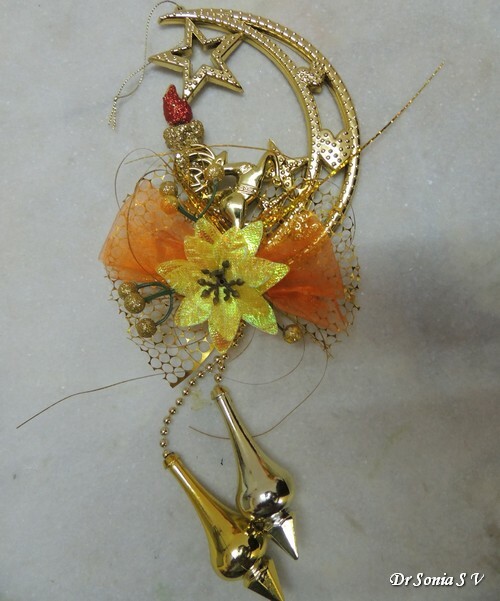 Hi friends I visited my friend Priya Sivaraj in Chennai recently and had an amazing time shopping from her craft shop. Shopping from a physical store can give you such a high and when the shop is owned by a knowledgeable crafty friend the experience is simply heavenly!! The Poppy Stamps tags die I used to make this tag is part of my huge crafty haul from Priya's shop and so is the gorgeous Kaisercraft Tea Cup stamp!